@wakest If this is even remotely true — that Google lets LEO abuse its SSO service — it is absolutely goddamn massive. It means LEO can impersonate you anywhere you use Google logins. @andi @wakest I don&apos;t think that&apos;s the case here - the sites mentioned in the screenshot all seem to be phishing sites set up *by* law enforcement, so Google isn&apos;t participating in this scam, at least not in that way. @ben @andi we don't know how the police got the usernames and passwords in this case, it could be either and we wouldn't know without more information. @wakest @andi if the police run the site, they got all that information from their own database. Law enforcement has access to which cell towers your phone is connecting to, and anyone who runs a website can see what IP address you&apos;re connecting from and what browser you&apos;re using. The requirement of logging in via Google is probably so law enforcement can claim that the entire Google account is guilty of the crime of *visiting the website run by police* and then take information from Google, which Google is required by law to comply with. @ben @wakest That seems much more plausible — the entire site is a honeypot. @andi @ben I was trying to figure out if anyone else is talking about this. 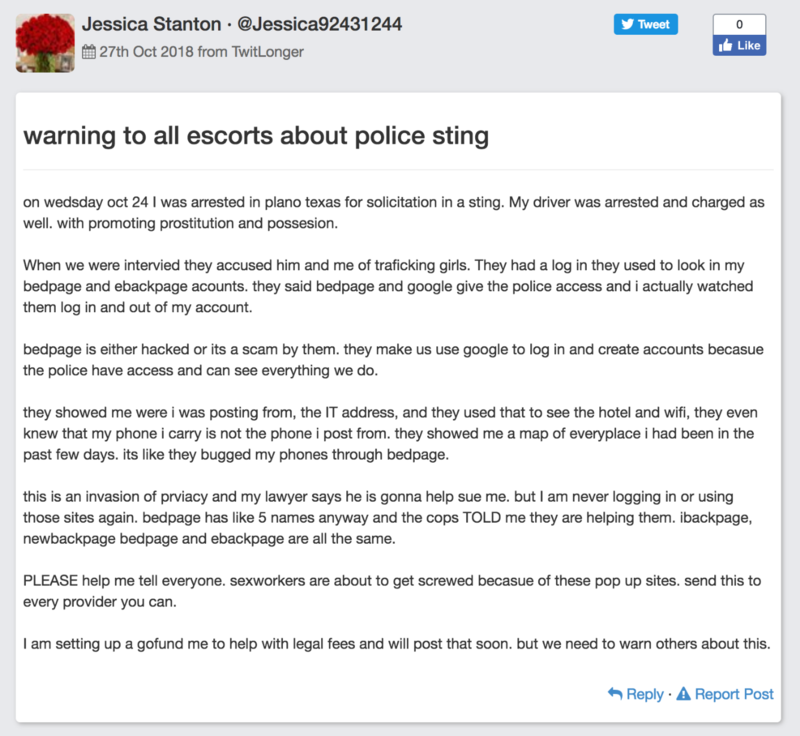 I did come across one other person who has been posting stuff about how bedpage is just a cover to steal creditcard numbers. "investigators will comb every inch of the shooter&apos;s house and his online footprint"
well, good to know the police are dedicating their prevention resources to a much more important issue than mass-murder. @ben @andi not sure if I understand your comment. @ben @andi I was worried you were saying the opposite.